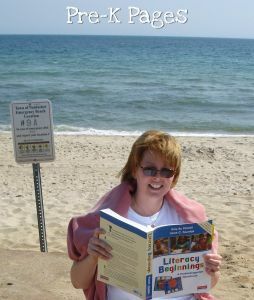 Up until this point Literacy Beginnings felt like an introduction, now I realize that the authors were just setting the stage and we are getting into the real content. This is where our real early literacy journey begins! In this section the authors provide a detailed outline of each of the daily activities. 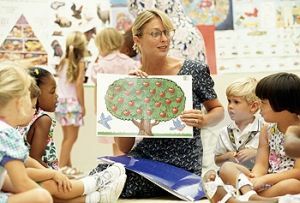 Parts of the day like circle time, literacy centers, choice time, library time, and writing time are explained in detail. During an interactive read aloud the teacher and students talk and think about the text together. Questions like “What do you think will happen next?” “Why do you think that?” and “What did you notice on this page?” are good ways to get students to not only talk and think about the book but also explain their thinking. 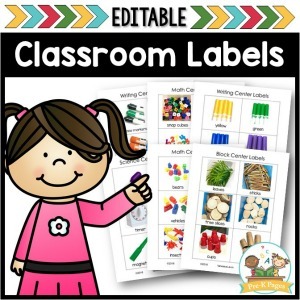 This also provides oral language practice which is good for all young children; especially students who are at-risk or second language learners. What’s your favorite interactive read aloud? Mine is No David! By David Shannon. During shared reading the teacher and children read in unison from a big book or chart with large print that can be easily seen by all students. 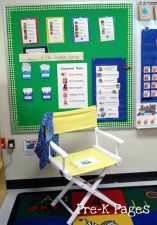 Shared reading allows children to practice early reading behaviors (concepts of print). Make sure to check out their list of 5 tips for reading time. Being read to is a familiar activity for most prekindergarten children and a beloved one for all. Do your students come to school with prior knowledge of books? This is my favorite part of Chapter 5 because it is something many teachers struggle with and I enjoy helping teachers so it’s a win-win! 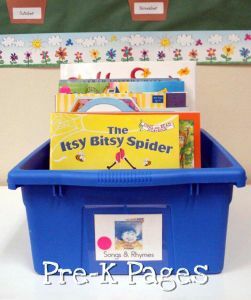 The authors recommend having books in labeled tubs or baskets by category. Eureka! I’ve always had my classroom library organized this way so it felt really good to see in print. This method makes sense and it’s easy for young children to grasp if you take the time to introduce and model at the beginning of the year. The authors also recommend having books in your classroom library that you have read to the class in addition to a selection of books written by the children. These are two of the most important ingredients to a successful classroom library in addition to a good organizational system. I would add that class books including the student’s pictures can also provide great motivation to read. Often my students who do not normally choose to visit the classroom library will go there just to “read” books with pictures of their friends. 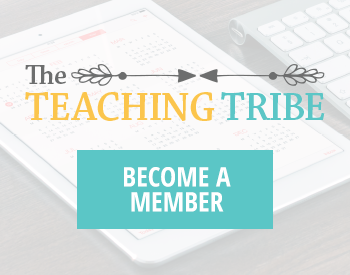 What classroom library tips do you have? Shared writing is when the teacher acts as scribe but the children participate in the writing process by answering questions posed by the teacher or offering their thoughts on certain aspects of the piece such as how a letter is formed, what sound they hear etc. 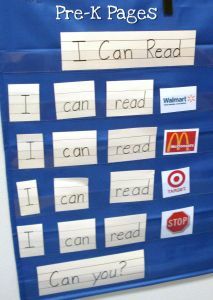 Interactive writing is similar but the teacher occasionally “shares the pen” with the students when it is appropriate. The children do not write the entire text independently, they write a letter or punctuation mark here or there with support and encouragement from the teacher. I’m not going to go into detail on this section because there is an entire section of the book on this topic starting with Chapter 15. Do you use shared and interactive writing strategies in your classroom? The authors provide suggestions for activities that will promote phonemic awareness and letter awareness as well as specific materials. 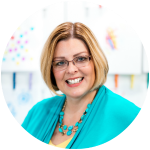 The importance of using student names to facilitate alphabet learning is mentioned. Starting with Chapter 19 this topic will be covered in depth. In this section the authors offer two sample schedules, one for full-day and one for half-day programs. I like this quote and I know from experience that it is true “Children are more comfortable, relaxed, and empowered when they know what to expect each day” (Ch. 5 pg. 65) You can see my sample schedules here. 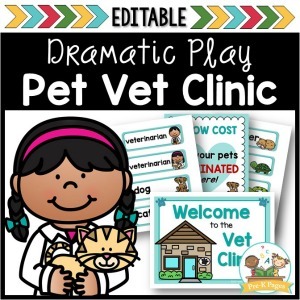 In this section the authors offer suggestions for a successful circle time with the overall message being to keep it short and sweet. I have a slightly different opinion about classroom helpers. I agree wholeheartedly with most of what the authors had to say in this section but I felt it was aimed more at private or affluent preschools. This is an area I have worked on improving during my years in the classroom; I have discovered what works and what doesn’t with at-risk and ELL populations. What doesn’t work for my parents is the very well written but long-winded sample letter given in the book. My parents would be very overwhelmed by all the text and therefore not read it. What does work for my parents is a weekly newsletter that is broken up into short segments, each portion illustrated with a picture to help with comprehension. I find my newsletters are just as effective with my specific population as long letters. The delivery method of information is also another obstacle for many teachers; let’s face it, most papers disappear into backpacks and are never to be seen again. This is why I use organizational binders in my classroom. I have had great success using organizational binders and my parents are usually well aware of what is happening in the classroom. Of course, if your parents have access to the internet, e-mail, and Facebook those are also great delivery methods. I believe that having informational parent nights, home visits, and conferences at least twice a year are also extremely important for strengthening communication with families. How do you communicate with families? Planned activities that engage the intellect, curiosity, and imagination of children are essential. The daily activities should be organized and predictable but consistently provide new and interesting content based on children’s interests and abilities. Opportunities for daily literacy learning are essential. 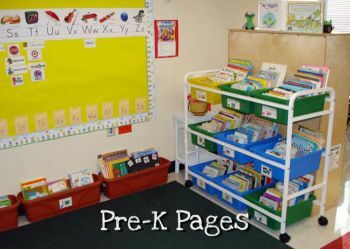 Activities such as visiting the library, phonemic awareness, and reading and responding to literature are essential components of the daily routine. Establishing a framework for language and literacy learning will be most helpful. Consistent communication with families about children’s literacy learning is vital. What are your thoughts about Chapter 5? Leave a comment below! If you write a response on your blog, be sure to link up to the Linky party below. Chapter 6: The Critical Role of Language in Learning will be hosted here at Pre-K Pages so stay tuned! I am excitedly awaiting for my book to arrive in the mail next week! I love reading through the blogs and gaining so much information. This was such a wonderful idea! There is one part of your blog that makes me sad. Where you stated so many of the children you teach have never had a book read to them before they reach your class. I was one of those parents who struggled to pay the rent, put food on the table, low income, bad side of town and a single parent with two boys but my boys still had books and I read to them often. This may sound terrible but I see those struggles used as excuses. Now,I work in an area where I have teachers, doctors and lawyers as my kiddo’s parents. It’s amazing to me to find even in these homes some children do not have anyone to read to them. Hi Tonya! I know, it’s so sad regardless of income when parents don’t read to their children. I try my best to get my parents to sign-up for library cards. We have the public librarian come to the school and they fill out applications, we pass out maps, calendars with story times, lists of recommended books etc. Most of my parents don’t speak any English so the public library is just not someplace they are comfortable going. Some are illiterate in both English and their native language. That’s why we need more public full-day pre-k programs, call your rep. I made an “alphabet book” for my 4yr old which includes objects specific to him/our family dynamics. (He images are glued on cardstock, then laminated, then bound with 3 rings). For example— “L” has an image with our library and its history, “T” has traditional tattoos and images of hubby and my tattoos, we include both nouns and verbs– “D” is the diving dolphin page etc. The originality of the book is priceless and it’s gotten some rave reviews from family and friends. At the end of the year I started a weekly “What I Learned This Week” with my students. We added one element each day, reviewed the days before, and then it was copied and sent home as my newsletter for the week. The kids took ownership of the process and it was a lot easier to understand for parents than a wordy letter. As to interactive writing experiences I have done them when writing thank you notes after a field trip or a special visitor. 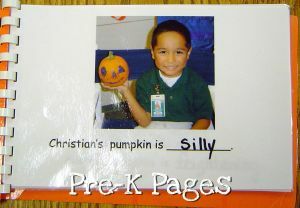 I am in a private Christian preschool so we also have a prayer list for prayer requests. I see that I can be doing more! Something that we do not do is calendar/weather. It is felt that these are just to abstract for students who are coming only 2 or 3 days a week. However, I can see that it can be workable if it is kept “short and sweet” as the text describes. I think the other teachers are thinking more of the longer Kindergarten calendar activities. Do most of you incorporate calendar/weather? I think I will have to give it a try this coming year. I look forward to the rest of the book! I am so glad you had this wonderful idea! With 4 kids of my own summer is still very busy, but this has made me take the time to read for my own enrichment. I am enjoying all the insight and am looking forward to the fall to implement more of these great ideas! I am happy to see that I already do some of these things and can do a lot more! Keep up the good work! 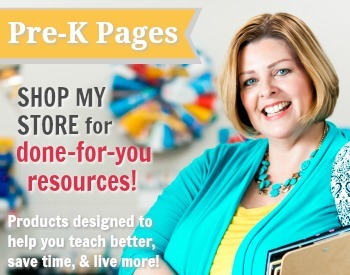 Thank you for sharing links to your resources. This chapter left me feeling a little bit overwhelmed, and I need all the help I can get!